Yes, why does it need to be said? Where is all the unnecessary pressure coming from? There isn't one source that overwhelmingly affects each of us in the same way, but I do think there are some aspects to our western (largely American) culture that factor into this mothering treadmill mentality. Here's what it's boiled down to: Company needs to sell a product or service. Company recognizes that they need to create a market. Company makes us believe we need what they're selling. But we don't. Beyond food, water, shelter, and clothes, we don't need what they're selling. We just want it all. I have to remind myself of this way more often than I want to admit. I once took my daughters to hear Condoleeza Rice speak at an event geared toward young women. It was excellent, but the overwhelming message repeated on a continual loop that day by Ms. Rice and the panel of professional and ministerial women who accompanied her, was that education is our hope. Education is an excellent tool, but it is not our hope. It gives us options and may change our course, but it is a lousy thing to put our hope in. And yet, a higher education is shouted at us relentlessly, and many of us begin to gauge our worth by whether or not we have a college education, a master's degree, a doctorate, and from where those degrees were earned. 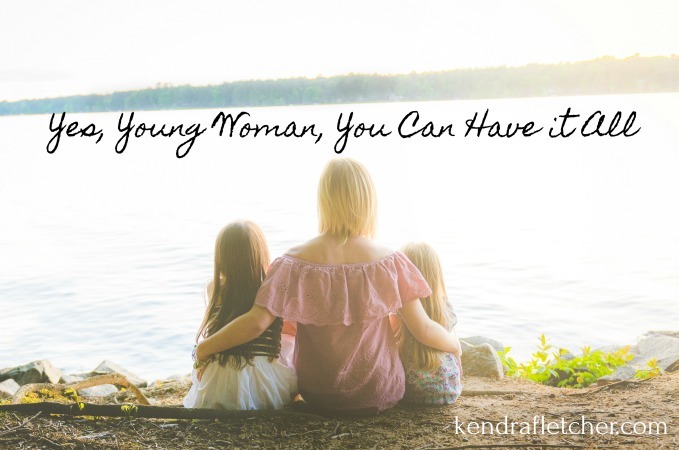 It isn't enough to "just" be a mom. You must have more, do more, and be more. At least, that's the cultural norm around here. BAM. There it is, swinging us right back to #1. What we want and what we need are two different things, and I think young women fall prey to the wants in a way that drains them dry and makes life exponentially more difficult. One of the best things said at that event where Condoleeza Rice spoke was when one of the panelists, a circuit court judge and mother of two, was asked, "Can a woman in today's world have it all [both career and hands-on parenting]?" Her reply was dripping pure wisdom. She looked up into the enormous crowd filling the arena and said straight into her mic, "Yes, a woman can have it all. She just can't have it all at the same time." In any stage of life, from student to young mother to mid-life, to older woman, the great challenge is to figure out what the needs are and what the wants are. They'll change as we enter new seasons and as our circumstances shake up. If we don't learn to be satisfied with where we are and recognize the beauty in each season, we'll never, never find ourselves fulfilled in any other. I also respect your privacy. Newer PostWhat If I Can't Find My Calling in Life? Older PostLost & Found Printable Graphics for You!